Hey everyone! 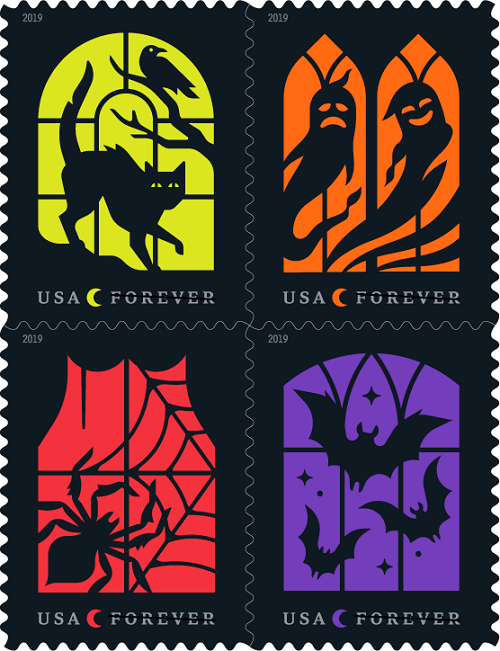 Looks like we will be getting Halloween themed postage stamps this year from USPS! These will make our card exchanges extra awesome. I’m so excited to grab a bunch of books. I’m happy to not have to order special ones. YAY!! These will go nicely with the JOL stamps they put out a couple years ago. I need to post the pic! Can't wait for them. They are so creative and cool. I hope like Christmas stamps they become a yearly occurrence. Too bad they won't be here in time for the Walpurgis or Red, White and Dead Card Exchanges. So cool! Can't wait to buy them. OMG!!!! Thank you so much for posting this!!!!! Did you see the Edgar Allan Poe stamps or the vintage Horror Film stamps? I’ll post pictures later!! Those are great! Will definitely be buying several books of them come autumn. That's actually quite a nice design!! Can't wait for them to drop! Here are the JOL stamps, not sure of their official release date but I bought a few books of them last year. Can’t wait to get the ones from this year! Papercraft Halloween Wax Seal Stamps?